Phase SL Zip Neck LS - Mens is rated 4.8 out of 5 by 4. Rated 5 out of 5 by ShredAK from Awesome for high output activities! This piece is perfect for high output activities like running, nordic skiing, or strenuous hiking. It feels cold in moving air when worn alone, so I either start by layering the Delta LT jacket over it or am sure to be moving if I'm not wearing layers. 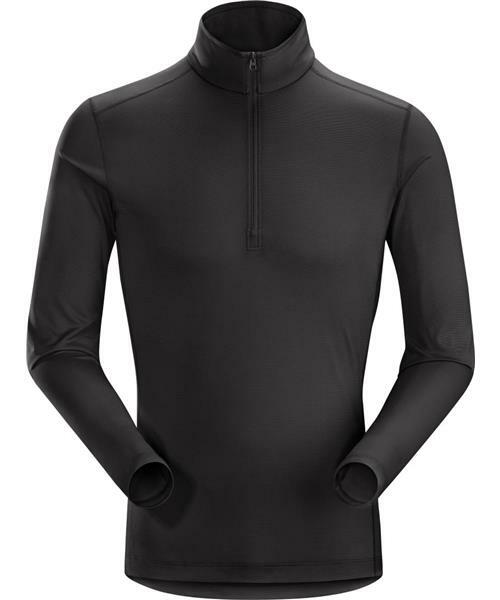 It is extremely lightweight and I would say it is fairly comparable to the Motus LS, except form-fitting and with a zip-neck for dumping heat. Rated 4 out of 5 by Pwdr from Luxury baselayer This top does exactly what I wanted it to: its long sleeves and slightly high neck give good coverage and warmth in the early morning/spring chill, but the zip allows venting and effective heat dumping, making it adaptable to a good range of conditions. Paired up with a fleece I've worn this rock climbing in North Wales and the Peak District and hiking in Brecon and on the North York Moors and more. It has enough warmth to it for the early part of the day but it can adapt with you. I know it works well at moving moisture away as I've kept my compass in the breast pocket of my fleece and taken it out to find it covered in moisture - clearly the Phase SL (and non-Arcteryx fleece) are doing their job at moisture management. I didn't feel sweaty at all during the day. It's comfortable in two ways: firstly, it's like silk, this is luxury. Secondly, the way it manages moisture, as mentioned above. It's so comfortable and effective I'm seriously considering replacing all my base layers with Arcteryx Phase when it comes time to change them. The only negative I can come up with is that the inside of the zip could do with a sleeve to stop the zip touching the skin. It can be cold on a chilly morning and just generally feels a little odd at first - but once I leave the house and am actually doing something I forget it altogether, so it's no big deal. Rated 5 out of 5 by Bretty from Great baselayer for any cool weather This is one of my favorite shirts. It is great at keeping me dry and warm but not too hot. I mostly wear this on warmer winter days. Very soft and smooth. Rated 5 out of 5 by Jeff from perfect shirt This my favorite shirt. As soon as it gets a little colder, I'll have it on all the time. It's so comfortable, it's easy to wear it as a base layer, but it also works well over a short sleeve base layer. The zipper is big enough to manage heat on a hike. Worn under a light down jacket, the combo is warm down to freezing. Also light enough to always be in my backpack.